Safety is very important to me when I travel, and I’m sure it is important to you as well. Besides being concerned about our personal safety, these days we also have to be aware of the potential theft of information. One of the ways this has occurred is the use of RFID scanners to grab personal information from credit cards, passports, etc. I’ve had the little envelopes where I’ve been able to put a card or a single passport, but I’ve not had anything to carry all the important travel items in once convenient place. But now I do have that. Pictured above is the travel wallet that I recently purchased on Amazon (amzn.to/2vPJ3PI). I chose the Light Grey version; they also have Dark Grey, Rose Red, and Green (Looks more like Teal to me). You can also ready my 5-star review of the wallet while you’re there on Amazon’s site. I have not had the chance to check out the RFID blocking capabilities, but I am confident it works fine. 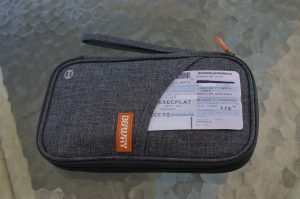 When the wallet is zippered shut, you can put your hand through the removable wrist strip and carry it with you, while your boarding passes are readily accessible in the front pouch. The wallet measures about 9.5 inches long and about 5.5 inches wide when closed, and it is only 0.75 inches thick before you start putting passports, cards, etc., inside. Inside there is plenty of space for four passports; two of the ones shown are the expanded 52-page passports, so those pockets are clearly flexible enough to carry the bigger ones. 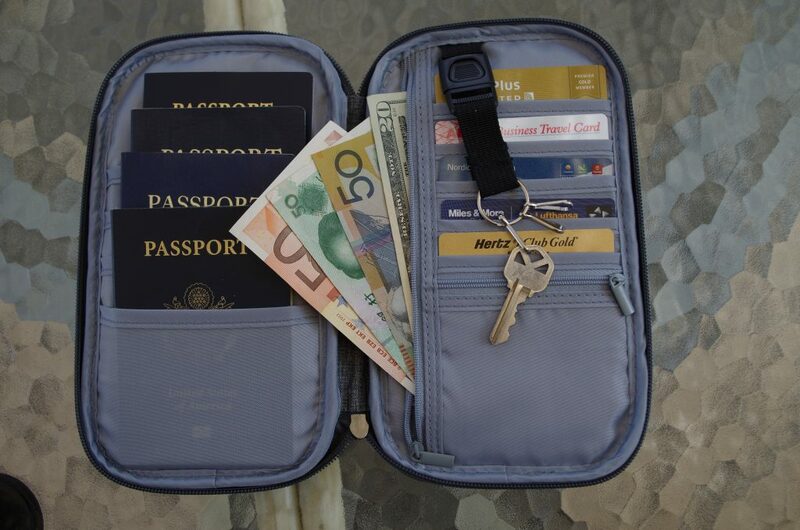 The long zipper pouch on the right side opens up to hold even the largest currency notes, and it’s also a good place to store copies of your passport identification pages (I suggest you also have copies of them in other places as a last-minute safety net.). The five card slots can hold credit cards, airline/hotel cards, even Global Entry or other Immigration cards. The smaller zipper pouch is for storing coins or other small items. The snap-off key chain is great for a copy of your house key or any other key you want to have with you. If you’re not carrying four passports, you could use on of the left-side pockets for a mobile phone, but I would measure the size of your phone before planning that this is your only place to carry it. 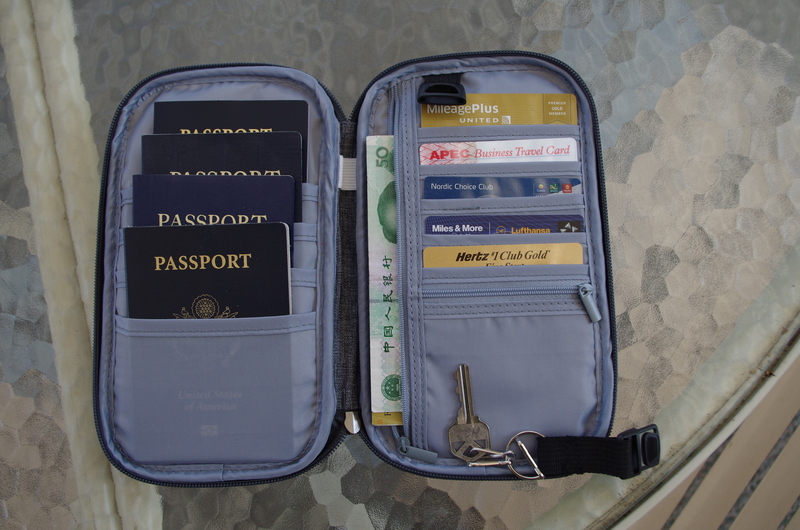 You could also use the pockets for important papers, train schedules, hotel information, etc. Do you know someone who likes to travel, but you don’t have any idea what small gift to get for them this year? How about this new RFID Blocking Travel Wallet (amzn.to/2vPJ3PI)? I don’t know any traveler who wouldn’t appreciate it as well as your thoughtfulness. Or maybe it’s just a “gift” to yourself? In any case, remember to be proactive in protecting your valuable information when you travel.